Car salespersons straddle several different responsibilities and goals on a daily basis. They must be persuasive and good with people in order to convince them to buy an automobile. They must be good with numbers so that they can put deals together that work for both the dealership and the buyer. They must also have solid and extensive knowledge of the vehicles they're selling. Most dealerships carry new and used automobiles. 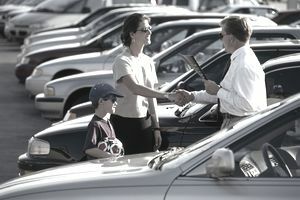 In general, salespersons earn more money when they sell used cars as opposed to new cars. Most auto sales professionals have compensation programs that include both a base salary and a commission program. Most dealerships have their own variations of this plan. Some might only offer commissions on used car sales and give placement fees for sales of new cars. Others might not provide a salary or they might offer a "draw" against commissions. Beyond a lucrative compensation plan, a successful auto sales representative often enjoys demo cars, manufacturer bonus plans, and discounts on vehicles, service, and auto parts. No formal training or education is required for car sales professionals, but some experience in a related field can help land a job. Education: A salesperson's education can include workshops, keeping up with industry publications, and car shows, often on an ongoing basis. This career doesn't typically require a college degree. A high school diploma is fine. Training: Training typically takes place on the job, and some aspects might be unique to each dealership. Experience: Any sales experience can be helpful, and can substitute for at least one year in the industry in some capacity, although industry experience is preferred. A car salesperson must have a current and valid driver's license. Test drives by buyers are common, but it's not unheard of for a salesperson to demonstrate a vehicle's features as well. As with any job for which compensation is dependent on sales, there are ways to maximize your earnings by focusing on and honing certain skills and talents. Extensive knowledge of a variety of makes and models: You'll want to be able to accurately explain why the car you're selling is better than others for a buyer's unique needs. Keep up with current events: Is the economy on the verge of collapsing or is it thriving locally? This can affect how willing customers are to commit themselves to significant purchases like an automobile. Personal appearance: You'll want to present a neat and neutral appearance. Leave the Hawaiian shirt and clinging leggings at home. Don't turn buyers off with your fashion taste before you even have an opportunity to make your pitch. Communication skills: When you do make that pitch, a gift for persuasion can be invaluable when overcoming objections. Learn to be polite and on holding your temper even when your pulse is pounding, because not every customer who walks onto your lot is going to be a charmer. Your livelihood depends on selling her a car regardless of her personality. Most dealerships experience high turnover rates, which can create many opportunities for people are interested in auto sales. But average earnings tend to be pretty consistent from year to year, indicating that opportunities for increased earnings and advancement within the industry are somewhat limited. The U.S. Bureau of Labor Statistics indicates that job growth in retail sales generally is anticipated to be about 2 percent from 2016 through 2026, which is slower than for the overall workforce. You'll report to the dealership each working day, meet with your sales manager, and spend time with your co-workers and customers, either those who wander onto the car lot or those with whom you've set appointments. Unlike outside sales positions, you'll be spending long hours at the dealership and—hopefully—a healthy portion of your time outside on the lot. Spending time outside means you're showing vehicles to potential buyers, and people don't just buy cars in good weather. Most established dealerships have compensation plans that are designed to motivate their representatives to sell the vehicles that make the most profit. This can create pressure to perform and meet quotas, especially when you consider fierce internal competition from other salespersons who want to sell to that customer as badly as you do. The main downside to auto sales is the long hours that most representatives are expected to work. It's not uncommon for an auto salesperson to work 12- to 14- hour days, many of which are spent waiting for customer visits. While this downtime can be used to talk with other sales representatives, the most successful automobile salespeople use their downtime to follow up on prospects or call customers to make sure all is going well with their new vehicles. If you have absolutely no retail sales experience, consider starting out in another area of sales to hone your skills first. As with any job, researching local dealerships will likely reveal the ones with a healthy work environment. You should fully understand the compensation model that your dealership offers before you commit to selling any vehicles. Some similar jobs might be considered lateral moves, while others can be attained with more experience and education.